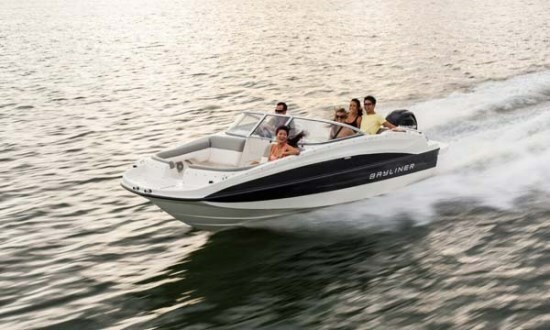 For 2013, Bayliner Boats offers twenty-two models of bowriders, deck boats, cuddies, and cruisers from sixteen to thirty-three feet, plus of course the all new stand-alone sixteen foot Element. 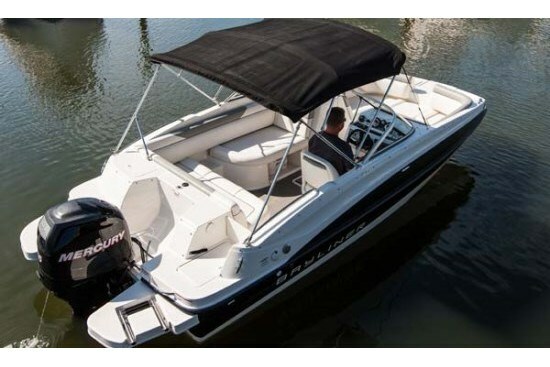 The “all new entry-level” 190 Deck Boat subject of this review is one of five deck boat models ranging from nineteen to twenty-one feet. As with most of Bayliner’s new deckboats, this smallest 190 model is also somewhat unique in the deck boat business in that its standard layout is a side console helm design with an acrylic windscreen to protect the driver from wind and weather. As an option, you can choose a full normal-looking and acting walk-thru wrap-around windshield. With either design, the interior and exterior of the boat remain virtually identical. 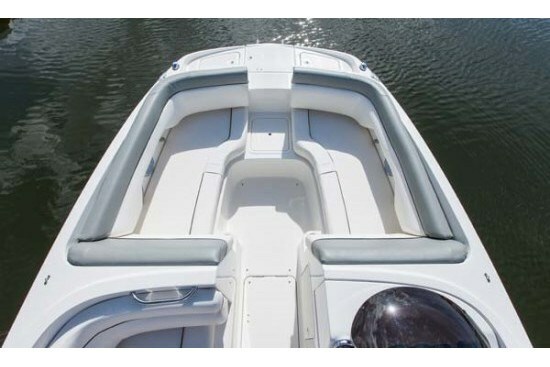 Bayliner refers to the seating configuration in the 190 Deck Boat as “Pontoon-style.” Except for the driver’s swivelling helm bucket seat, all other seating is bench style, accommodating potentially more than one person. Overall, the 190 is rated to hold eleven persons maximum – more than adequate for this size of boat. Across the transom is a three or four-seater bench with storage below. 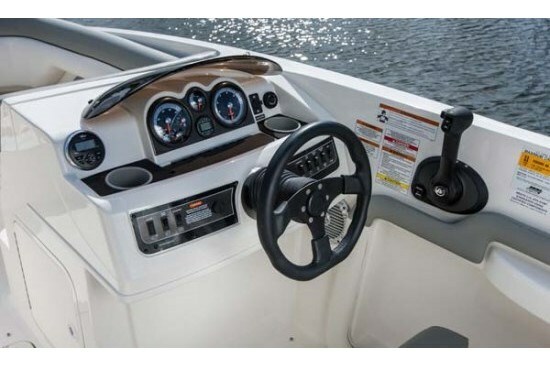 On the starboard end of this seat is the handy and practical gated step-thru to the molded aft platform section, further enhanced with a swim step on each side of the standard Mercury 115 hp EFI 4-stroke outboard motor. The starboard side swim step includes a stainless steel telescoping boarding ladder. 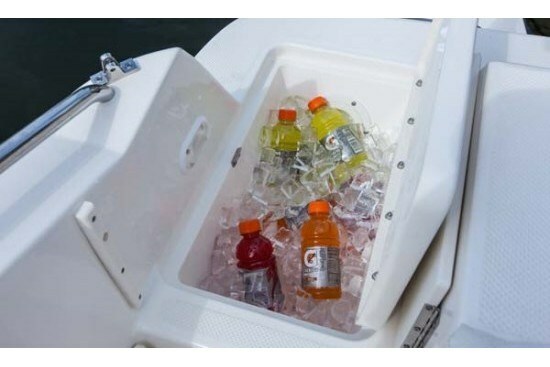 An insulated storage compartment beneath the step-thru becomes a handy drainable cooler. Opposite the helm on the port side is a two or three-seater lounge with full padded backrest on the passenger console. Beneath this seat is dedicated storage for the standard portable removable cooler. Ahead of this lounge seat, the port side passenger console storage with tote may be optionally upgraded to include a portable toilet with privacy curtain. 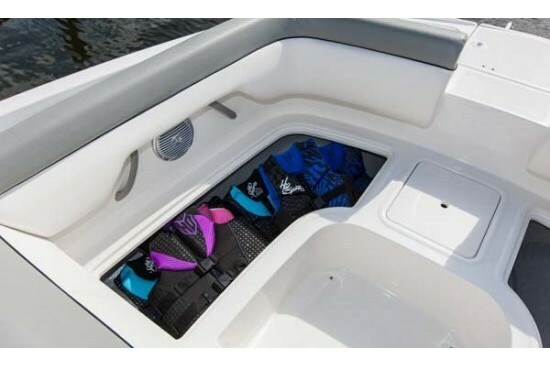 An in-floor waterski/wakeboard covered storage compartment is provided. Up front is fully upholstered U-shaped seating around the entire bow area with padded backrests all-round permitting this area to double as lounge seating. Each underseat storage compartment can uniquely be converted from one large storage area or into two or three separate units with the utilization of provided portable dividers. The full-width molded fibreglass bow platform contains more storage compartments, one dedicated as an anchor locker, and the centre compartment contains a covered, recessed, stainless steel three step telescoping boarding ladder for those occasions when you want to gently run your 190 up onto a sandy beach and get on and off in shallower water or directly onto the sand. 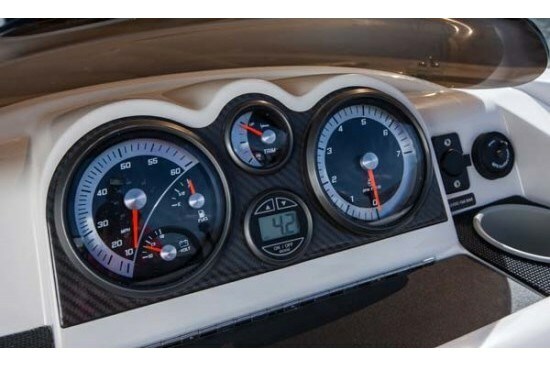 The molded driver’s helm console is very straightforward with a centre gauge cluster with tachometer, speedometer, fuel, volt, and trim gauges plus an hour meter and 12-volt dc outlet behind a custom padded and tilting steering wheel. A waterproof 120-watt satellite-ready AM/FM stereo/controller with inputs for iPod & MP3 is standard equipment along with four cockpit speakers. 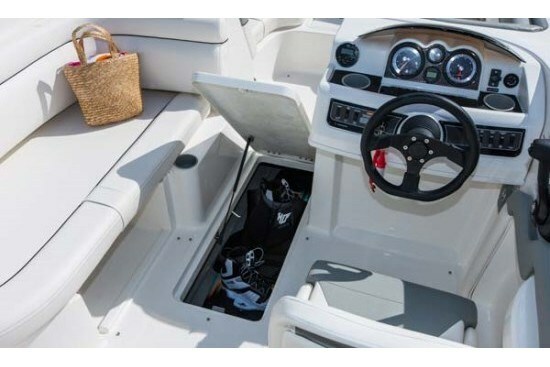 There are a host of options available for your 190 Deck Boat to personalize it to almost whatever degree your boating lifestyle requires. Four option packages head the list. First off is a Stainless Steel Trim Upgrade Package which, as the name implies, converts to stainless steel such items as drinkholders, thru-hull fittings, gunwale molding, the horn, and the fuel fill deck plate. The second package is called a Preferred Equipment Package which includes a bimini top with boot, your choice of blue, black, or red hull colour along with a deck gel stripe. The Flight Series Package adds all of the Preferred Equipment Package plus custom Flight graphics and a wakeboard tower. 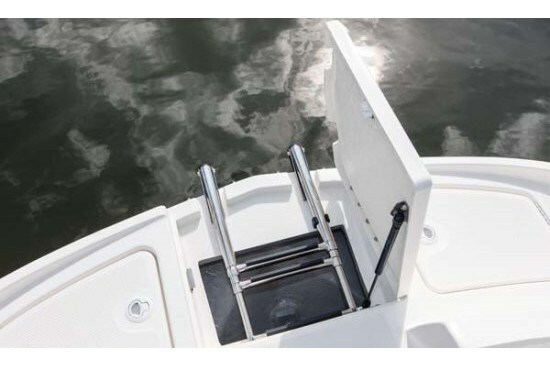 If fishing will be a major part of your 190 Deck Boat future, go for the Fish Package which includes a Motorguide bow trolling motor, bow casting platform and seat, a conversion of the transom seat to allow it to flip down to create a stern casting platform and adds another seat for this, a livewell under this stern seat, a Garmin Fishfinder, rod storage and tackle box. A long list of individual options is also available including such items as a bow filler cushion, cockpit carpet runners, ski pylon, transom shower, digital depth indicator, and almond coloured upholstery, among many others. A single axle painted or galvanized, swing-away tongue trailer with disc brakes is also a factory option. Depending on your boating needs, you can move up from the standard 115 hp to 135 or 150 hp outboard choices from Mercury. As you can see, your 190 Deck Boat can be all and everything you need and want it to be.